Let me tell you about one of the loveliest and tastiest squashes that I grew this year. I'm never without a butternut squash lurking somewhere in my kitchen so wanted to grow my own this year. 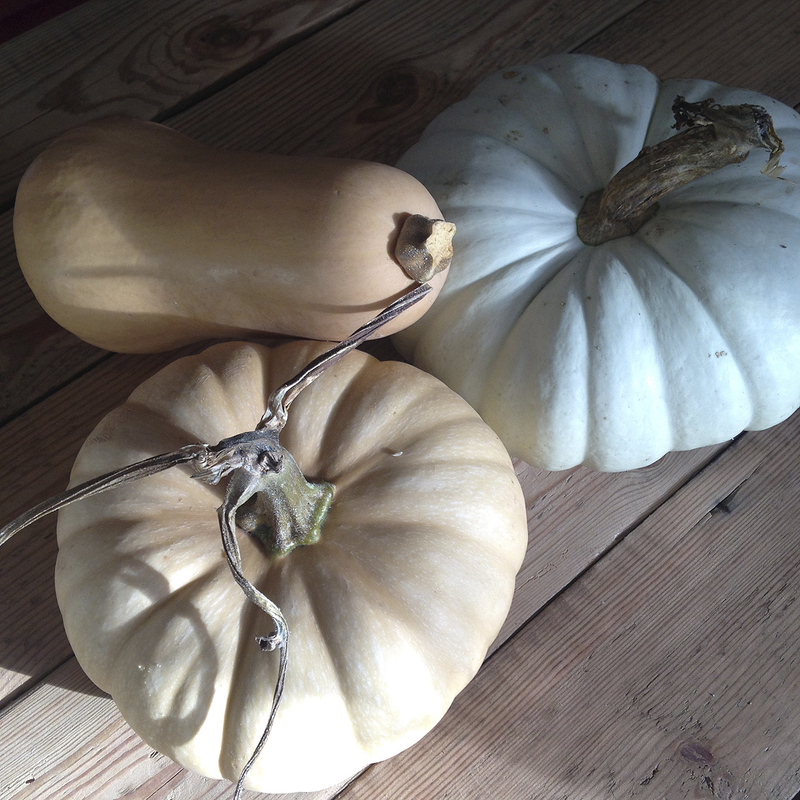 But how much better to grow a squash in the shape of a pumpkin! My eyes lit up when I saw seeds of a new hybrid called 'Squashkin' in the Marshall's catalogue last year and I promptly ordered some. But first, another tale. I was never the child that tore into Easter eggs or birthday presents, instead I teased out the moment, savouring every tuck in the paper or release of tape, trying desperately to avoid a glimpse of what was inside. I could leave my Easter eggs in their cellophane for weeks and know it annoyed my siblings no end that I still had chocolate long after theirs had been eaten. It was my way of eking out the anticipation and choosing the right moment to indulge. Until, that is, a particularly beautiful Easter chocolate sculpture of birds in a nest with their speckled eggs was left too long in the sun and melted. Dismay, disappointment and regret ensued. I always make extra for leftovers lunch the next day. This was so good that the pot was scraped clean for second helpings. 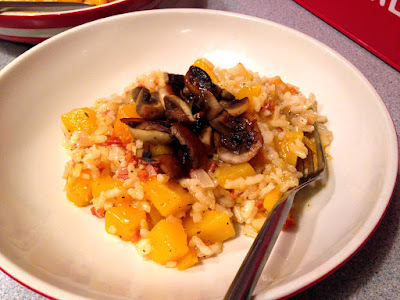 Risotto is so easy to make that I feel silly offering this as a recipe - consider it more as inspiration. Sometimes I use leeks or shallots rather than onions, or stir blue cheese rather than parmesan through at the end, or no cheese at all, or perhaps some chicken leftover from a roast with sliced red bell peppers or a sprinkle of chilli flakes. A risotto of frozen peas and parmesan is perfect for small children - although squash added to that makes it very pretty and just as popular. I just love that the base dish is so adaptable. And there's no need for all that stirring and waiting, although that in itself can be very soothing. My son, being a student with no time for faffing in the kitchen, taught me to throw everything in after sweating off the onions. He puts his in a big Le Creuset pot, gives it a good stir, pops the lid on and leaves it in a medium oven for 40 minutes. It tastes just the same. 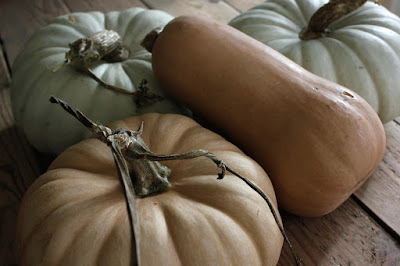 The real reason for writing this post is to suggest Squashkin as a good vegetable to grow next year if you have the space. (Allow one square metre per plant.) 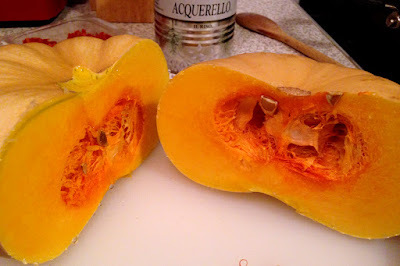 The flavour was really good - and definitely superior to supermarket butternut squash and big orange pumpkins. Cooked in the stock with the rice, the chunks of squash softened and absorbed the other flavours and the end result was utterly delicious. Job done! Add a splash of olive oil to a large casserole pot or non-stick pan. Have the pot over a low flame. Melt the butter in the oil and add the finely chopped onion. Stir to coat and cook on a very low heat until soft and translucent. Don't let the onion pieces burn but a long sweating is good as this sweetens them. Peel, deseed and cube the squash. Add the squash cubes to the onion as you go, stirring in. After 10 minutes or so, add the finely sliced garlic and cook gently for a minute. Add the rice, stir to coat with the pan juices. Sprinkle with herbs, if using. After a minute, add a good splash of hot stock. Stir. After another minute of stirring, add all the remaining hot stock and stir for a few seconds. Pop a lid on and leave it to simmer, checking every once in a while to give it a stir and make sure nothing is sticking to the pan. When the rice is soft (I like mine slightly over cooked, rather than 'al dente'), add the chorizo and stir through to heat. (At this stage cheese and/or chopped parsley can be added.) There you go, dish up and it's ready to eat. Hands up all those who garden through the winter? And how many of those hands are currently getting cold while gardening? Or dog walking, foraging, chopping logs? Indeed any outdoor activity during winter. Personally, I find numb fingers very challenging. Well, my lovelies, I've found a solution in the gloves photographed above. Like many others, I was always told that if you keep your extremities warm (feet, head, hands), the rest of your body would stay warm too. In the days of coal fires and cold rooms when I was very young, I remember my grandad wore his woolly hat to bed in winter; his head was almost bald so needed the extra protection! My mum made sure that my siblings and I had warm knitted mittens, thick socks, wool coats and hats on before she shooshed us outside - and it worked, we stayed warm and had rosy cheeks from the fresh seaside air ... even if we looked like the Start-Rite kids. Much more recently, there was a conversation thread on the Facebook Garden Bloggers group about what gardeners wore to keep warm. It was generally agreed that layers was the way to go, with thermal vests and tights under t-shirts and trousers, and jumpers or fleeces under protective gardening garb. Woolly hats were recommended, thick socks under gardening boots helpful. A flask of hot water for tea or coffee, essential. Tea, toast, cake and a warming fire something to look forward to at the end of the day; several mentioned the hypnotic allure of a good bonfire in the garden at this time of year. 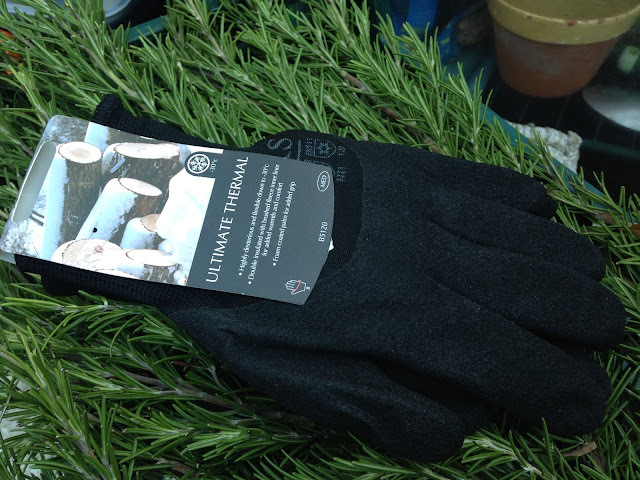 It became apparent that many gardeners don't stop in winter but wrap up warm and get on with it. Those fruit trees and shrubs are not going to prune themselves. My opinion? Essential kit for all winter gardening. Disclosure: Briers gifted me a pair without asking for a review but they work so well that I wanted everyone to know about them. Briers Ultimate Thermal gloves. Now £5.99. Flexible down to -30ºC; double insulated with brushed fleece inner liner for added warmth; foam coated palm for added grip. (The coating also makes the fingers and palm water resistant.) Sizes: Medium, Large, Extra Large. (I have small hands; the gloves were slightly loose but not overly so, and worth it for the warmth they gave.) Washable. Thank you to everyone who took part in this giveaway. 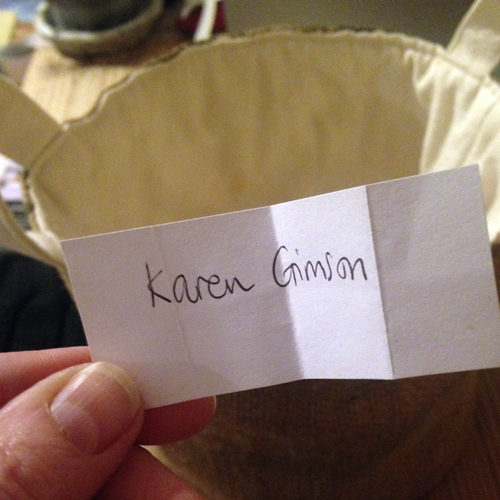 The winner's name drawn from the bucket last week is Karen Gimson. Congratulations, Karen - enjoy your fabulous prize! I'm feeling very pleased with myself as christmas is usually a last minute thing in my home but, yesterday, a real Nordman fir tree was purchased and the first flutters of christmas excitement began. The box of decorations has been retrieved from up high, candles will be lit, cakes made and snowglobes brought out. The twinkle of indoor lights is especially welcome this winter as I've lost most of the light coming into my home thanks to scaffolding boards sitting just above the window lintels. Add in short days and grey skies and the room is in more or less permanent deep gloom. Never have I needed a deep dose of hygge more. So to brighten my day, let's have a look back at a cornucopia of lovely things that have come my way this year and might give some inspiration to fellow gardeners - and, if you read (or skip) to the end, there's news of a very generous and lovely giveaway. How many people are currently hunkering down inside, away from plummeting temperatures and relishing the warmth and cosiness of being tucked away from the cold? I know the temptation to stay indoors on a dreary, possibly drizzly, day gets me every time. Grey skies do not motivate me. But I always surprise myself with how good it feels to get outside, wrapped up against the cold, for a walk or an hour's work in the garden. There are always jobs to do, even (or especially?) at this time of year. I still have leaves to rake and store, bulbs to plant and mulching to finish. Trees need pruning and a few perennials need to be relocated. I admit I enjoy the peace of working outside in winter, it clears my mind and gives me the headspace to think. Last weekend Michelle at Vegplotting blog hosted another of her #mygardenrightnow challenges, inviting gardeners to get together on social media with a snap of themselves in their winter gardens. We've had such a good warm autumn (and by that I mean temperatures still in the mid to high 50F range (10-15C) with occasional sun) that many of those gardeners were able to show plants in bloom. Could I match that with anything in the veg patch? Let's have a look.